Last month we had the pleasure of exhibiting at a very successful H2FC in Hannover. It was our second successive year exhibiting at the show and we have already reserved our place for the 2019 event! We took the opportunity to showcase our range of regulators for Hydrogen fuel cell applications including UAV drones, vehicles and vehicle refueling. 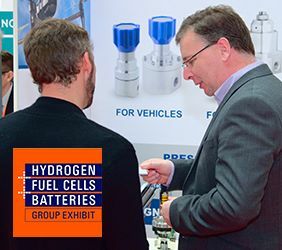 We had lots of interest in our products and had the pleasure to speak to a wide range of contacts including some of the world's biggest car manufacturers who are continuing to expand into the hydrogen fuel cell market.